Michael was 19 when he decided to use the internet to find his younger sister. Adopted as a toddler, he was unable to make contact due to his sister's age - she was only 16. "I took it into my own hands," he says. "The internet's so wide-ranged now, you can find anybody." Michael says it took him just five minutes to find her profile page. Luckily, the approach was not entirely unexpected. "She messaged me back more or less instantly and said 'I think you're my brother'." Michael and his sister are among a growing number of adopted children searching for their birth relatives using social networks and the wider internet. He would phone every night when he was drunk and rant at me. My birth father is not a nice guy. Michael's story is a positive example - they now meet up regularly. Yet until Michael had contacted her, he had no way of knowing whether his sister even knew she was adopted, let alone that she had a brother. "This is what worried me at first," says Linda, Michael's adoptive mother. "What if she didn't know that she was adopted? What if she didn't know that she had a brother? There's so many 'what ifs', it's quite risky really. "I was in the room while he was on the computer. "He said 'ah mum, I think I've found her'. I panicked. I said 'Oh Michael, please be very careful what you say'." It is a trend which is causing great concern among adoption specialists. So much so, the British Association for Adoption and Fostering met in Cardiff to discuss the issue. "I think Facebook, and other social networking sites, has the potential to blow adoption out of the water," says Helen Oakwater, an adoption specialist, speaking at the conference. "The thing that Facebook allows to happen is it allows the birth parents and the child to reconnect at a much earlier age. "So, a couple of years ago, birth parents might have been able to reconnect when the child is 18, 19, 20... nowadays it's actually happening with children at 13, 14, 15." This age difference presents a potentially volatile situation as a naturally rebellious adolescent now has the means at their disposal to find and make contact with their birth siblings without the support and guidance which typically runs alongside such life-changing moments. "Some, within a few months of making contact with their birth families are actually seeing the birth families regularly, and in a number of cases have gone back to live with them," says Helen Oakwater. "What we're also seeing is that for some of them [it's] already starting to fall apart - because the birth parents haven't changed. "They're the same birth parents behaving in a similar way to the way they were behaving when the children were removed by the court, and by social workers." Talk openly and honestly with your children about social media, contact issues and the risks involved. Then work together to come up with solutions. 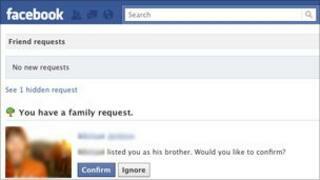 Look at privacy settings so that your children's profile can not be seen publicly, and also hide lists of 'friends'. Explain to your children the risks involved in accepting random unknown people as 'friends'. Make sure they are not making public information that could help identify them, such as their date of birth or address. Avoid using profile pictures. Instead use the default pictures or something generic like flowers, landscapes, football team logos etc. Don't tag children in photos posted online, and ask friends and family to be aware of this also. Make sure your children are aware of the risks of joining groups or networks that identify where they live or go to school. Make sure your children know how to 'block' people so that if they do receive unwanted contact it can be managed. For Lucy - not her real name - finding her grandparents' address on the internet led to an upsetting ordeal with her birth father. "When I was 14, I used the internet to trace my birth grandparents' address," she recalls. "I wrote to them, and my birth father rang me a few days later. I was so excited at first, he made himself seem like a lovely father. "At first it was all 'how are you my darling daughter? ', but the next time it would be abuse and foul language. "He would phone every night when he was drunk and rant at me. My birth father is not a nice guy." Paul Harrison, from digital firm Carve Consulting, believes that a young person's desire to share themselves openly online cannot be stopped. "I think for young people that act of sharing - we live in a decade of openness - is almost preconscious, they do it without almost thinking. "So it's about a) understanding it and b) having, I believe, open, meaningful, honest conversations with the children and talking about what might happen because it probably will." Ms Oakwater agrees, adding that it's too late to try and stop adopted children from searching for relatives online. Instead, preparations for contact, and education around the emotional impact, should be introduced at an earlier age - pre-empting a child's desire to start searching. "The genie is out of the bottle. Children are going to go on Facebook. "We need to empower the child, we need to help the child make sense of their past. "They need to understand what really happened to them, so they can look back and get a sense of their early years that's really balanced and they can understand that it's not their fault." To that end, the BAAF has published a book entitled Facing Up to Facebook, designed to guide worried parents through these difficult stages. "What you're going to say to a seven-year-old is different to what you'll say to a 14-year-old," continues Ms Oakwater. "You need external people to help a child work some of that stuff through. "We have to face up to the intrusion of Facebook and actually get adoption support and therapeutic help in place earlier and longer."